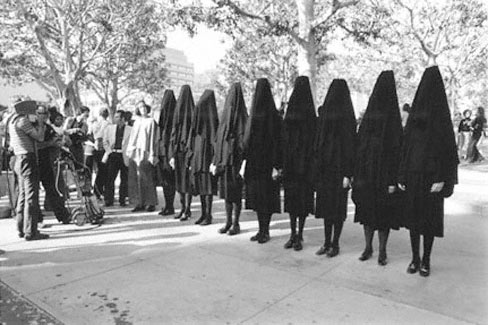 In Mourning and in Rage (1977) by California artist Suzanne Lacy (now recognised as a distinct politically relevant performance art 'school of thought', out of the West Coast of North America). 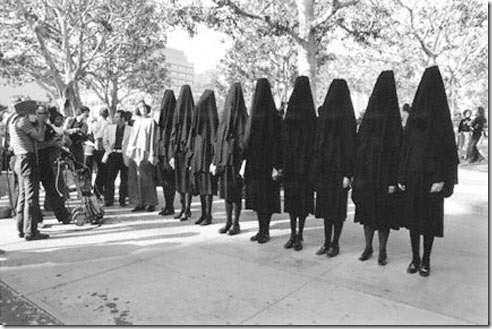 Protestors are in robes and hoods; this isperformance art using textile arts (costuming) as a social-change activist strategy, to protest against the murders and rapes of ten random women in Los Angeles. A 2009 heightened anxiety (about the self’s connection with ‘the other’ and ‘the material world’) has driven us to Craftivism. Ever since the advent of the mid-1990s information age when ‘the screen’ took precedence over real-time relations and touch, Western conceptual craftivists have rebelled against ‘time management’ and ‘efficient production’. 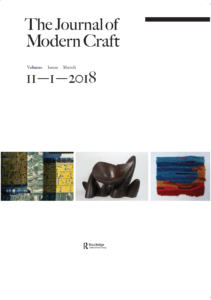 “The hand-crafted artefact” is a labor-of-love: by engaging in craft as a practitioner, craftivists reject conspicuous mass consumerism (I am speaking as a resident of a Commonwealth country). We also reject ‘the discarded readymade’ as the primary medium of the installation artist. When I am working as a craftivist, I think that I am hoping for some kind of physical confirmation of my attempt to be a more fully humane human being. Authentically crafted objects offer enjoyment simply in the material pleasure of their awkward existence. In craftivism, the artist is able to enjoy the notions of ‘sustainability’ and ‘civility’ because the making of The Crafted Artefact takes time and, often, a long-term connected relationship with both the materials and other people in public and in private. Craft circulates in a gift economy rich in relationships, but not necessarily in cash-flow. By continuing as a craftivist artist – designer, or a place-making site-specific sculptor, since the advent of high speed internet, late 1990s, I have accepted being a luddite. Kevin Murray and I laughed that we were both luddites, over a fair-trade chocolate in Tasmania last July. (The word luddite refers to the protesting British textile workers of 1811-16 who destroyed labour-saving machines which represented technological advances in their industry). But craftivists don’t really reject technology, we rely on it too much for communications. Craftivists like myself are concerned with the lack of e-civic activism or ‘real-time’ civic participation in the public sphere since people’s really human links with one another have become deadened by the constant anaesthetization of the extreme juxtaposition between ‘the intimate’ and ‘the anonymous’ (due to digital communication advances). Our lives seem to be tenuously based upon ‘only-the context-at-the-time’; connection, once dependent upon human warmth and kindness to one another are, therefore, always at risk of fracture. Craftivists comment upon this state of a lack of sustainable community relations, and the building and mending of the social fabric of our lives, through their making of ‘things’ and performances with these crafted things in public space. I am an installation artist-turned Craftivist who used to work as a site-specific, public artist, mainly in compressed earthen materials, a different branch of the fiber arts: organic conceptual minimalism (see www.lyciatrouton.com). Now, as a textile installation artist – craftivist, I am curious how women’s leadership roles in community(ies)-of-violence have been impacted. The community with which I have chosen to be most concerned with, as an artist, is a community-in-crisis: that of North and West Belfast, Northern Ireland, my neighbourhood-of-origin,. This is a place that has sustained 40 years of extreme violence and a very high rate of inter-urban migration. Women artists employ gendered ‘textile arts strategies’, together with oral storytelling or silence, in various protest-vigils which use cloth /costuming as metaphor(s). A typical artform for women makers and craftivists is commemoration. For example, a Northern Ireland example of Craftivism and “The Art of Survival” to communicate the personal experience of war, loss and grief was a quilt exhibit, 2008. This was curated by Roberta Bacic and was funded, in part, by the European Union Programme for Peace and Reconciliation. The exhibition included 10 small-scale Peace and Reconciliation quilts and circulated with the Londonderry/Derry Council Heritage service, Northern Ireland. Examples of various late 1960s to 80s public needlework protests, different from quilting but referencing the art of textiles, are included in the images and captions at the end of my response (to be continued).